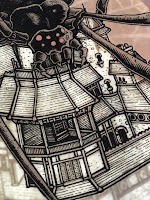 I've not been quiet about my love of the Locke & Key series by Joe Hill & Gabriel Rodriguez. It's one of my go-to recommendations for anyone who can take some of the spooky stuff. Back in 2013 I did 13 pieces of original art as tip-ins for the Head Games (volume 2) limited edition set. This December a one-shot stand-alone issue of the series comes out and I was asked to do a variant cover for it. 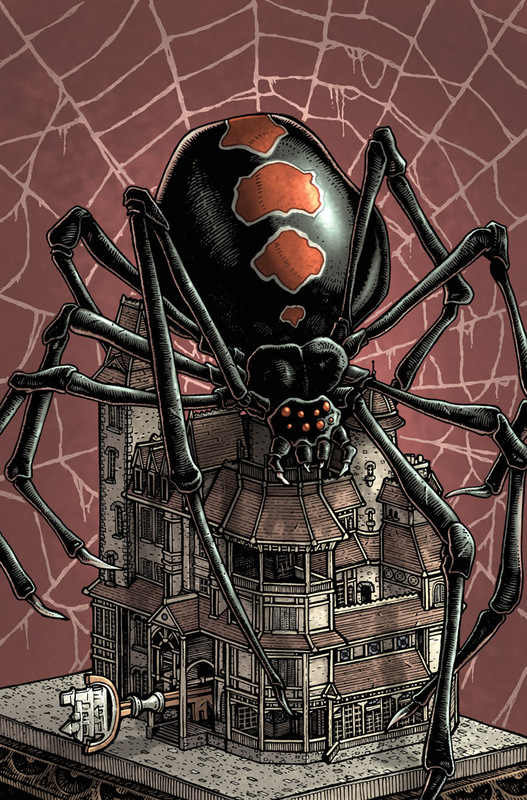 "Three years after wrapping up their award-winning, best-selling Locke & Key saga, the team that built Keyhouse returns to Lovecraft, Massachusetts with a new tale of terror and suspense! 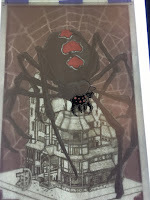 An impossible birthday gift for two little girls unexpectedly throws open a door to a monster on eight legs!" Here you can see the finished cover, but below I run through a step-by-step process of creating the variant cover art. 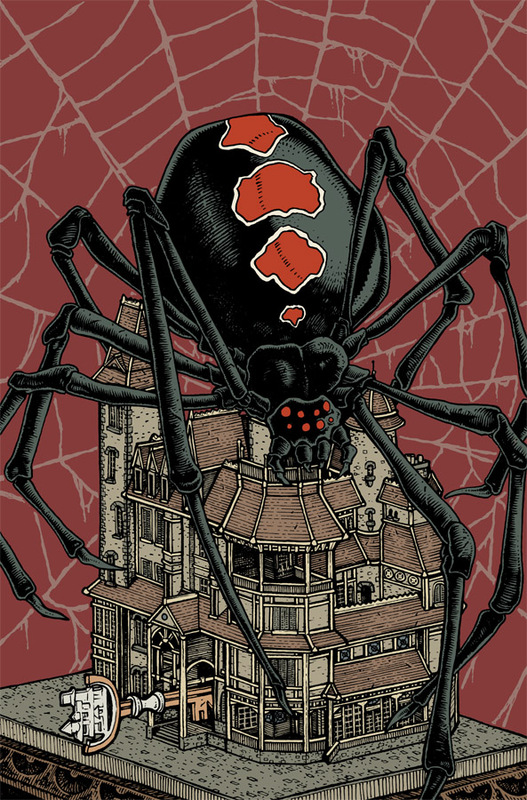 After reading the synopsis and then the script for this story, I decided to focus on the spider and they doll-house version of Keyhouse. 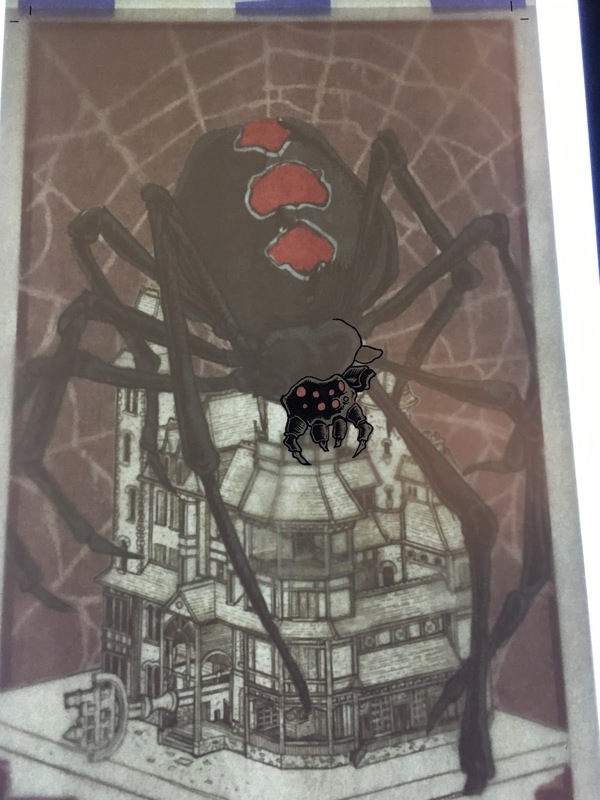 I consulted Gabe for two things, 1) the specific species and pattern markings of the spider (google image search gave to wide a variety to assume) and 2) a Google Sketchup model of Keyhouse that I could turn and rotate for reference. The model is the main geometry of the house, not filled in with the trim, brick, or even many of the windows, so I had to study through my L&K volumes to get all the details presented in my chosen angle of Keyhouse. 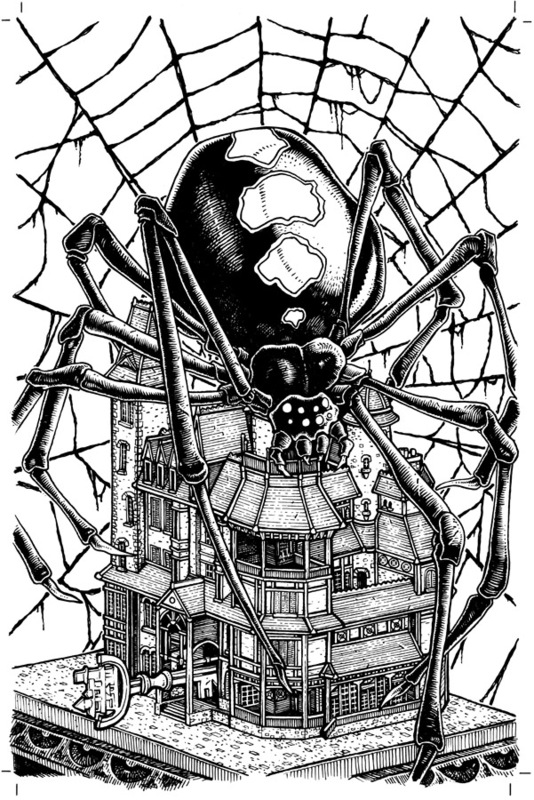 After I had a my tight drawings of the spider and Keyhouse, I assembled them in Photoshop. 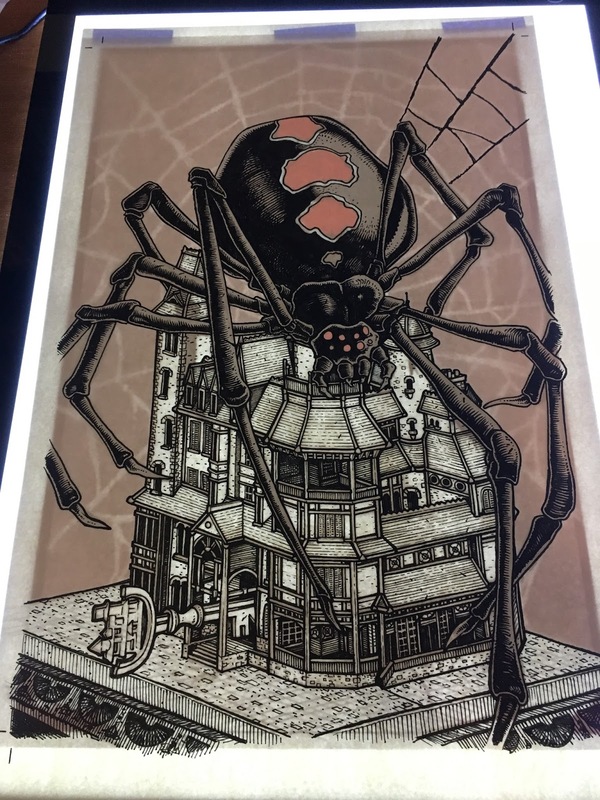 Because they were drawn as separate elements, I could manipulate them individually, changing the scale, rotation, even shifting the spider's legs, without disrupting the house behind them. 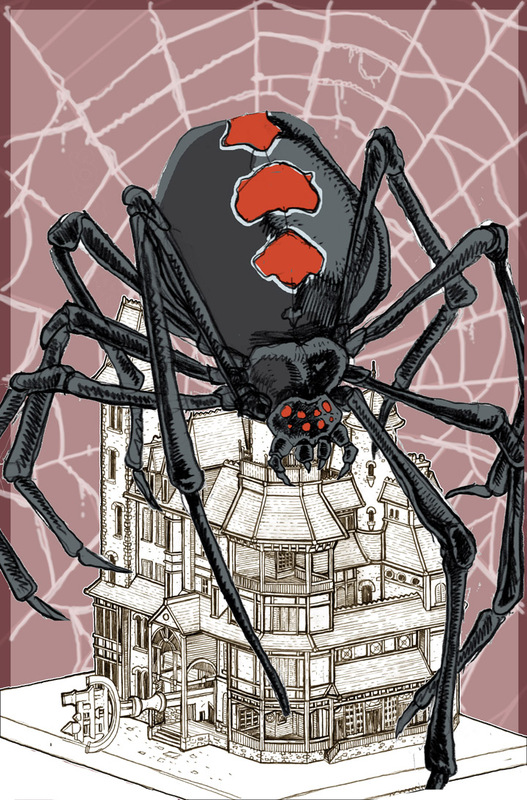 The colors I put down were just a way of helping me to see the final image better, what was house and what was spider (and what was background). I drew in a web digitally and it not only helped me decide what to do with the background, but also the web lines drew the eye inward to the spider's head and the core of Keyhouse. I printed out the above composite (being 10" x 15" I had to print the top half and bottom half separately on two sheets of printer paper and then tape them together.) I taped the printout to the back of a sheet of Strathmore 300 series bristol. On a lightbox (I'm now using a 17" x 12" Huion light pad) I was able to see the printout through the bristol so that I could ink directly on the bristol surface without having to transfer or re-pencil. 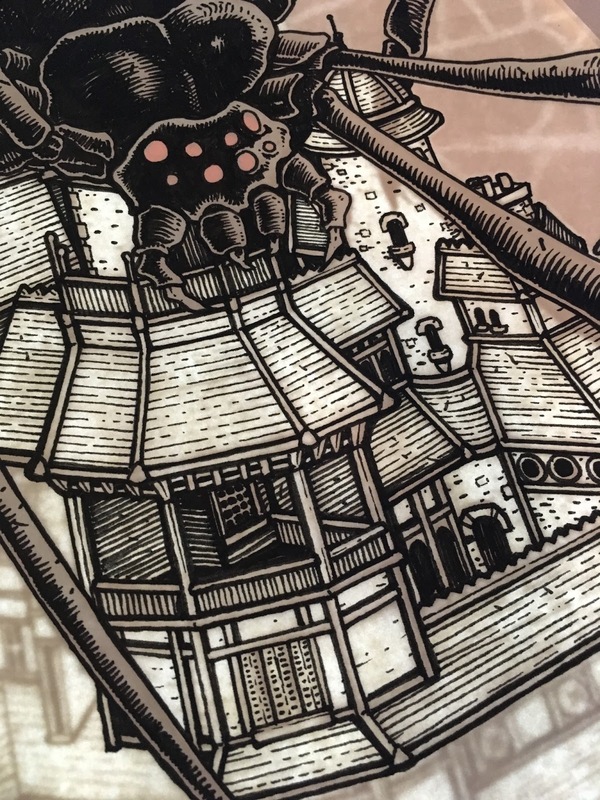 The inking was all done with Copic Multiliners (the 0.7 & 0.3 nibs with a bit of brush for the larger fill-ins on the spider). Once the inks were done, I scanned in the lineart, cleaned up any flaws and imperfections, and then started everyone's least favorite part of coloring: flatting. 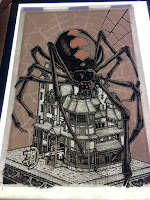 It's the part of the job where you isolate different areas as different colors: the spider's main body is a different color than its markings, which is also different from Keyhouse and the background, and the webbing....not to mention all the little house details like roof, stone, and trim. Most of the color selection here was close to what ended up being the final...but that was mostly because the colors were already established either by previous L&K content, sample images of the new key, and nature. 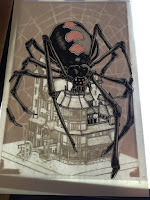 The final rendering was all done using the Photoshop tools Dodge & Burn (and then a bit of color shifting here and there on the Spider's legs). Dodge is a tool used to lighten an area (there are some other controls for the range and exposure) and Burn is to darken an area in the same way. I use a textured brush as I use either tool, which gives the work that pebbled look. 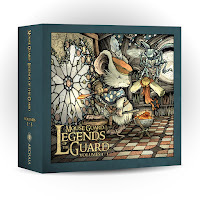 To the right you can see the final cover art sans-logo. 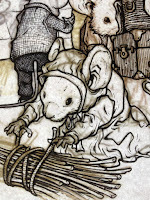 Locke & Key: Small World will be out in December. "Many were digging and tunneling busily; others, gathered together in small groups, examined plans and drawings of small flats, stated to be desirable and compact...Some were hauling out dusty trunks and dress-baskets, others were already elbow deep packing their belongings; while everywhere piles and bundles of wheat, oats, barley, beechmast, and nuts lay about ready for transport." It was very hard to narrow down all the moments in the book to choose to illustrate. 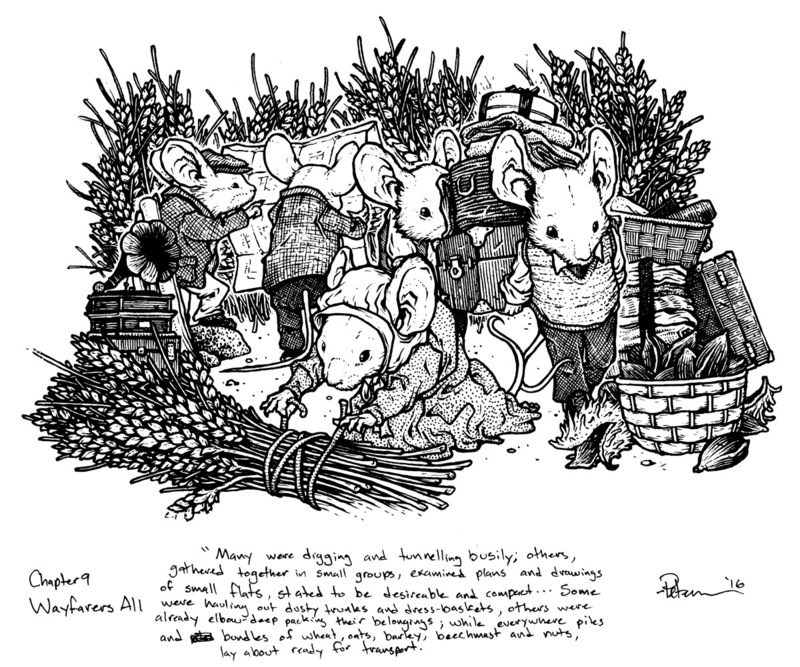 In chapter 9 Rat goes on a early fall walk to find the field mice getting ready to leave the fields, which will be soon ready for harvest, packing up all their belongings and planning for the future. 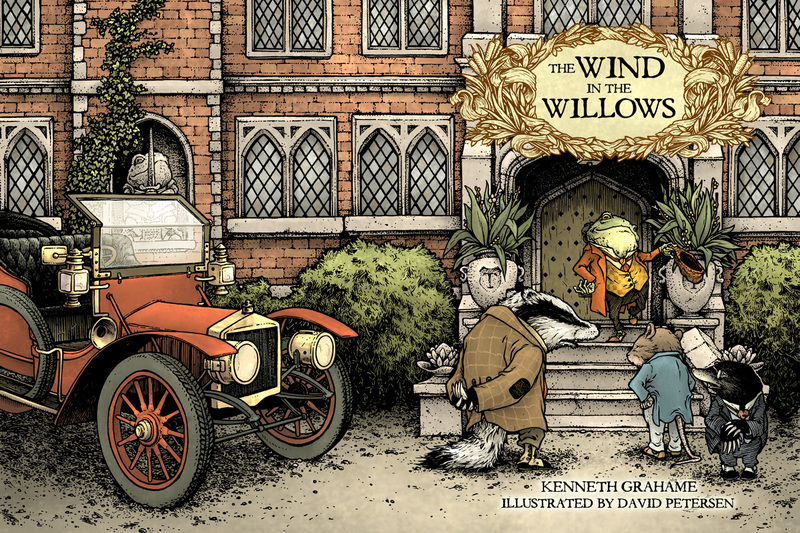 One of the troubles with illustrating this book is scale. At times the animal characters seem that they could be tiny, their appropriate size in our world, while at other times they must be somewhat bigger, or even the size of tall children. 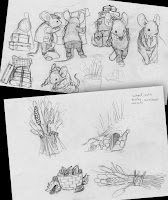 With the mice pacing up all the natural harvest items, it made that job more difficult, but I opted to not include Rat, so that his size relation to them is not known. 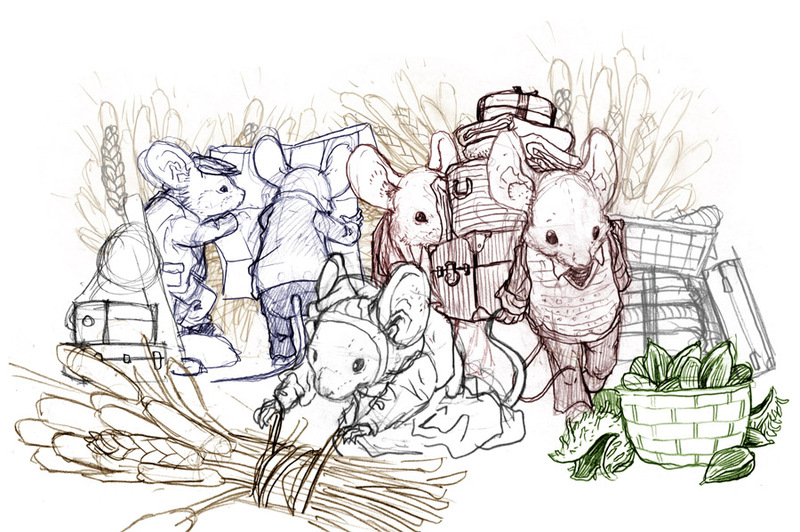 I sketched out several mice hauling, packing, and looking at plans. 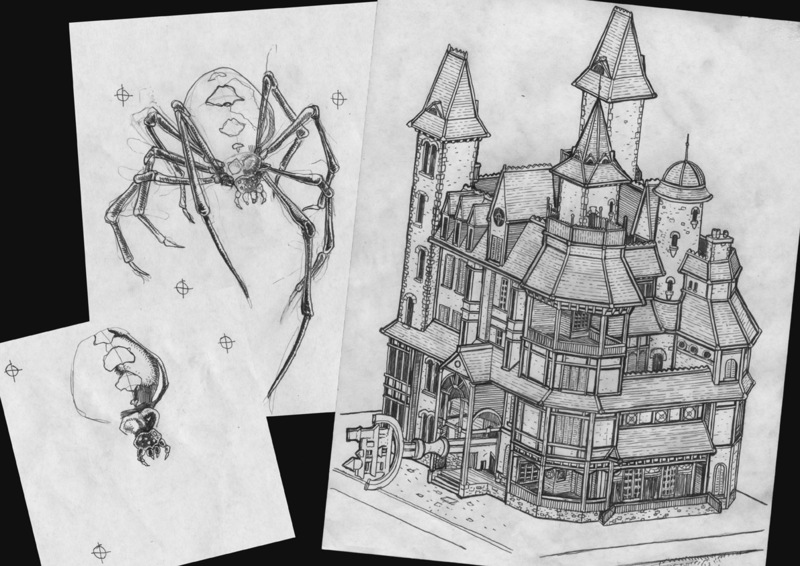 I then scanned those pencil sketches and in photoshop, composited them into a layout that told the story. I tinted each mouse a different color so I could see where the mess of lines for one ended and the mess of lines for another began. 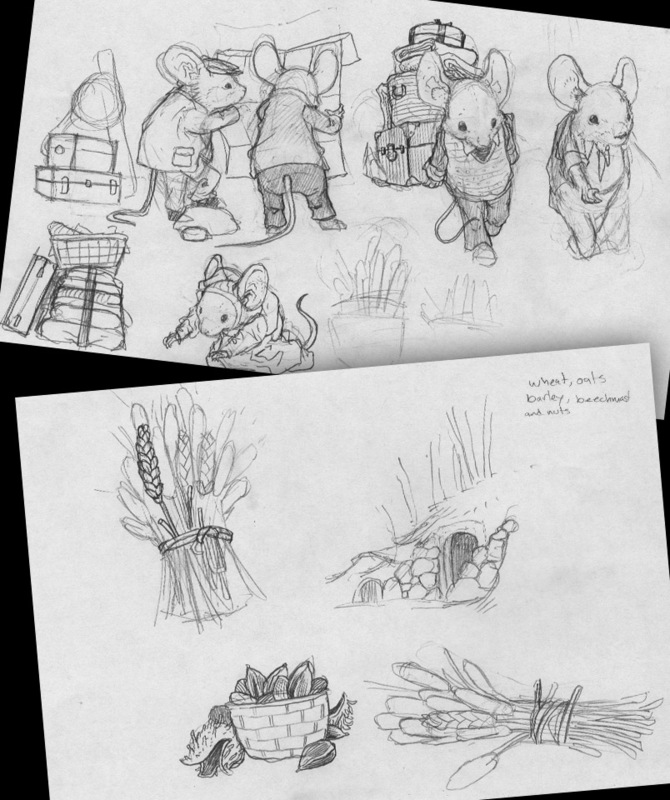 Instead of redrawing the vertical bundles of wheat (or barley), I copied and pasted the sketch several times over to build up the shape of the mass I wanted behind the mice. The digitally composited sketch was then printed out at-size (about 11" x 7") and then taped to the back of a sheet of 300 series Strathmore Bristol. On a light box I was able to see through the bristol's surface to the printout so I could ink on the bristol using the sketch as a guide. For pens, I used Copic Multiliners (the 0.7 & 0.3 nibs). 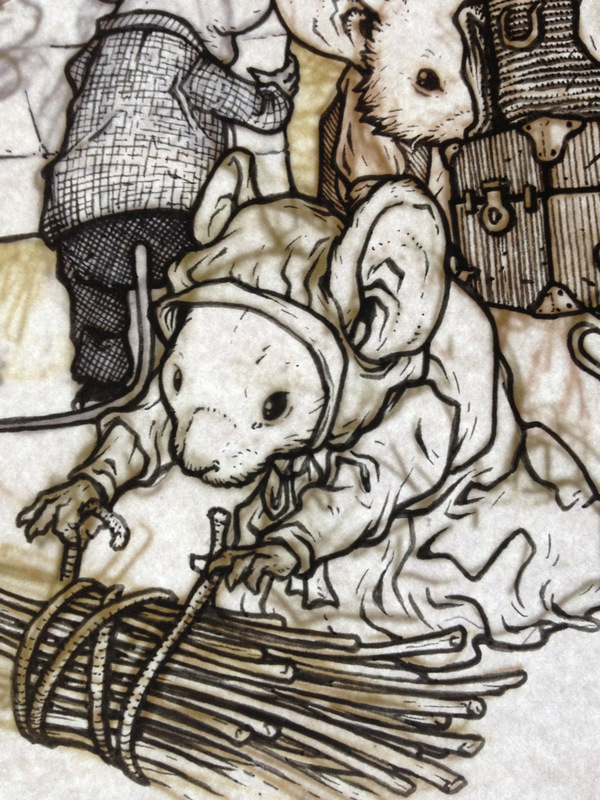 Here I have two in-process photos I took with my phone and posted back when I was inking this piece. 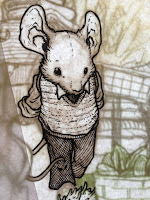 Drawing and inking mice for this book took a conscious brain-shift to do. 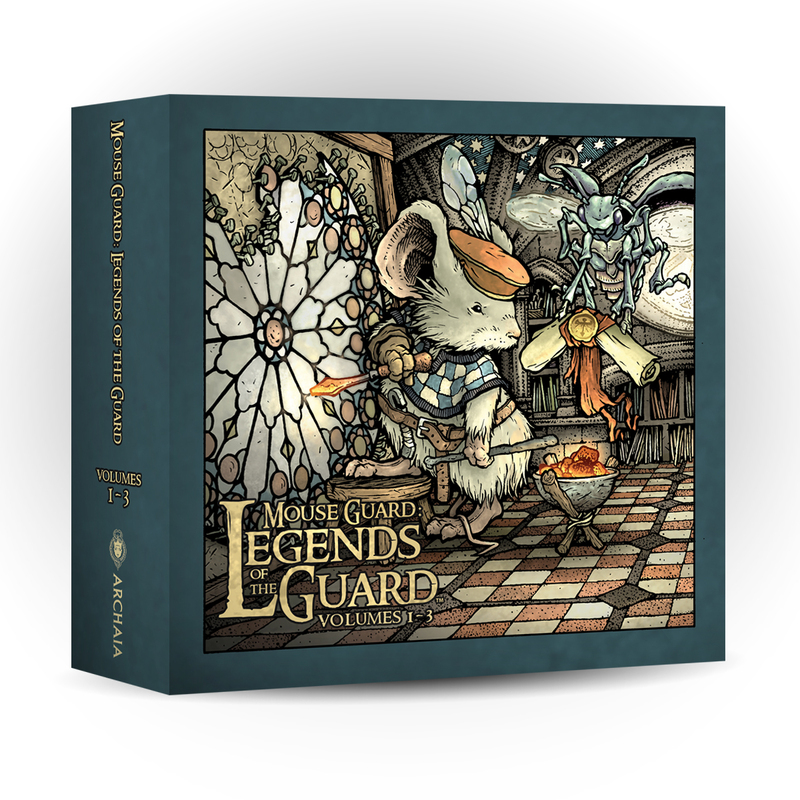 I wanted them to look like my drawings, but not like Mouse Guard Guardmice. The bodies are obviously different proportions, and that was easy to get around because of the clothes, but altering the features of the eyes, inner ears, and even some of the shape of the face took some concentration. With so much going on in this piece, I needed to focus on the textures. Not only are the natural items important to texture and give a pattern to, but so are the clothes, the variations in fabric, and the tonality of the various trunks, dress baskets, and boxes. Last month, I painted a Mouse Guard piece that will be up for bid in the charity auction at New York Comic Con this weekend. The charity benefits St. Jude Children's Hospitals, and to-daye, the NYCC & C2E2 auctions have raised over $240,000 for St. Judes. I documented my process painting this 15" x 20" piece as I broadcast live from my back yard. 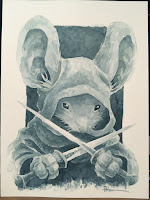 Below are the 3 videos of the full painting (the videos were interrupted when urgent calls from my Mother came in that I had to take) and the questions I'm answering were the ones being asked by folks watching live at the time and commenting on Facebook.